Waylon thinks most problems can be solved with science. But when it comes to having to share a dog with Baxter Boylen, science may not be very helpful. Baxter is the closest thing to a juvenile delinquent Waylon has ever met. He's always getting called to Principal Rice's office, and now he's even having meetings with the chief of police. At least the two boys can visit their dog, Dumpster Eddy, while they're at the station. Eddy is behind bars in the Stray Animals' Lock-up. When a new Animal Control officer takes over, it looks as though the dog's days are numbered. Waylon comes up with a science-y plan to save Eddy, but can he trust Baxter to help him carry it out? Sara Pennypacker splits her time between Florida and Massachusetts, were she feels lucky to be able to write every day. She is the author of many children's books, including the #1 New York Times best-seller Pax; seven in the New York Times best-selling Clementine series; two in the Stuart series; Meet the Dullards; Summer of the Gypsy Moths; and Sparrow Girl. Her books have won numerous accolades, including a Golden Kite Award, a Christopher Award, and several children's choice state awards, and they have appeared on many Best Books of the Year lists. For more information, visit www.sarapennypacker.com. Marla Frazee illustrated all of the books in the Clementine series. 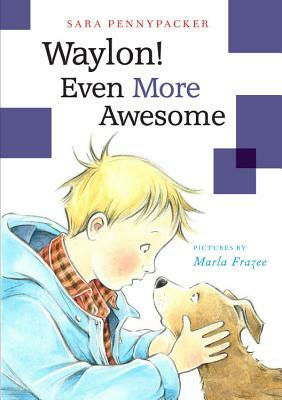 She was awarded a Caldecott Honor on two occasions: for All the World by Liz Garton Scanlon, and her own A Couple of Boys Have the Best Week Ever. She is also the author-illustrator of Roller Coaster, Walk On!, Santa Claus the World's Number One Toy Expert, The Boss Baby (adapted into a Dreamworks film), Boot & Shoe, and The Farmer and the Clown. Marla teaches at Art Center College of Design in Pasadena, California, has three grown sons, and works in a small backyard cabin under an avocado tree. Visit her at www.marlafrazee.com.